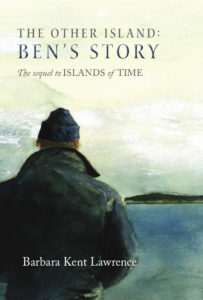 In Islands of Time, Becky Granger, the daughter of a prominent New York family visiting Maine for the summer, told her story about falling in love with Ben Bunker, an islander from a family of Maine fishermen. Now, in the sequel, Ben tells his side of the story. Ben’s account deepens our understanding of the characters and events in Islands of Time but stands as a compelling story on its own. Ben, now a fisherman and a marine biologist, also shares his experience and perspective on the changing fisheries of the Gulf of Maine and Georges Bank, and the ways in which these changes affect his family and community, as well as all of us who share this planet and its oceans. Fish, love, and Maine! What’s not to like? Lawrence blends them beautifully to create a portrait of all three that combines science and art into a great read! —Linda Greenlaw, best-selling author: The Hungry Ocean, The Lobster Chronicles, All Fishermen are Liars, and many more. Her most recent book: Shiver Hitch. As a summer resident since 1948 and a “year-round summer person” from 1979 to 1995 and from 2015 to the present, BARBARA KENT LAWRENCE has seen many faces of Maine. Her academic background in anthropology, sociology, and education, extensive experience in research and nonfiction writing, and her deep love of Maine ground her novels in its history and culture.